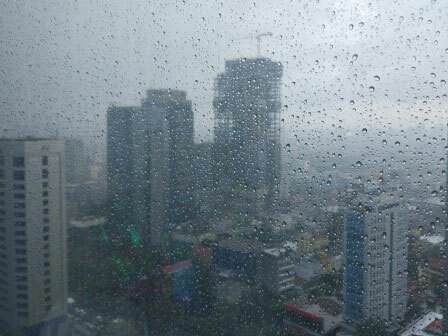 Meteorology Climatology and Geophysics Board (BMKG) predicted several areas in Jakarta will be rain today.
" We predicted local rain in South Jakarta and East Jakarta in afternoon"
BMKG's Public Relation Head, Hary Tirto Djatmiko mentioned, this morning all Jakarta areas including Seribu Islands will be partly sunny. "We predicted local rain in South Jakarta and East Jakarta in afternoon," he informed, Saturday (9/1). He explained, partly sunny will occur in North Jakarta, West Jakarta, and Seribu Islands while rain in East Jakarta and South Jakarta tonight. "Central Jakarta is potential to rain at tomorrow's dawn," he added. Today, southeast-northeast wind velocity to reach around 10-25 kilometers per hour with humidity around 55-90 percent. "Temperature could reach 24-32 Celsius degree today," he conveyed.